I was no particular fan of the first "Paul Blart"
I find Kevin James to be very talented, but much like his friend Adam Sandler, he seems to not like to take chances. The comedies he chooses to star in are safe fluff, as if his filmography has to have one theme only. 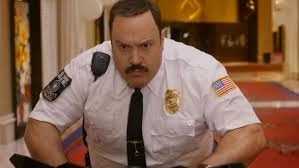 I thought Kevin James was very good in "Paul Blart: Mall Cop," but the movie was so on-the-nose cute that it was hard for me to really get into it. If you enjoyed the first Paul Blart: Mall Cop," I am sure you will enjoy this sequel. I found most of it somewhat charming. The film isn't full of "fatboy fall down" jokes, something I really beginning to become sick of. Kevin James once again, throws every ounce of his heart into the movie, and everybody overall does very good work. It is a movie that wants so very hard to be a great endeavor. But once again, it falls short. Its a movie that is too predictable to matter, its too familiar to be engaging, and its too regular to be surprisingly funny. I don't want it to sound like I don't like "feel-good" movies, because that's simply not the case. There is plenty of cheery, cutsie-poo movies that really hit my sweet spot. But the difference between the best of the "feel-good" movies and something like "Paul Blart: Mall Cop 2" is that the movies I like don't have to try hard, they have enough confidence and charm to win me over every time. I think "Paul Blart: Mall Cop 2" is a very safe movie, and that makes for an experience I feel I have had a million times before. I like the movies I like because they feel timeless, in their own times. I understand that in the year 2015, it is really hard to be original, but making something feel fresh is a whole lot better than playing it safe. This sequel picks up after Paul's marriage lasts six days and his mother passes away. Down on his luck, he needs something to finally go his way. That something comes in an invitation to a security officers convention in Las Vegas, a convention he takes his daughter (Raini Rodriguez) too. Unbeknownst to Paul, his daughter becomes flirtatious with one of the resort workers (David Henrie), and a criminal named Vincent (Neal McDonough) is planning to steal several pieces of art from the hotel they are staying at. You want to know how Paul catches on to Vincent? Giggle, are you sure? Paul daughter accidently, almost as if out of convenience of the plot, walks in on to the bad guys planning the heist! Giggle! The scene is so random and shows that they just pinched the scene in so that Paul had something to do and save the day. No matter how lazy the scene is, I was glad they did it. By the time the movie really got going, I had enough of the predictable single-father-not-letting-go-of-his-daughter material that literally suffocated the film. Neal McDonough plays a great villain, he has always been a solid villain. He tries very hard to make this movie count. Heck, Rodriguez, Henrie, Loni Love, Nicholas Turturro, Ana Gasteyer and the rest of the cast tries to make this count, but the story is so cold and dull that it never goes anywhere, despite how well the actors are doing. There are some funny moments, James really shines in several scenes, even scenes I would have expected to fall flat if I were reading the script. There is also a big showdown between the other security officers and Vincent's henchmen that is somewhat fun, but for most of the running time, I wasn't laughing, I was barely chuckling. For me, how I judge a comedy comes down to how much I laughed. I am willing to admit that I have a sense of humor that is wide ranged, and I will also admit that I have a tendency to have a very immature sense of humor. I love slapstick of all types, so if Kevin James, who particularly specializes in that type of comedy can barely get me to crack a smile, something is wrong. This won't kill Kevin James' career, I just wish he could get out the typecast syndrome and become a bit more adventurous with his decisions.